I'm sure many of you wonder how all the different cricketers spend their time off the field, what they do in their free time, and so on. We read about a lot of the off-field activities as well. Such as Michael Vaughan and his real estate investments, Shane Warne and his nurses, Shoaib Akhtar and his genital warts, Imran Khan and his love child, Andrew Symonds and his "binge drinking", to mention a few. 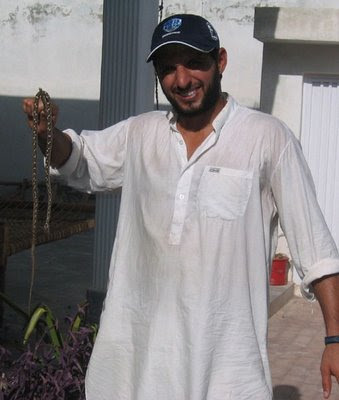 Shahid Afridi's off-field activities, however, seem to be of a very different kind. 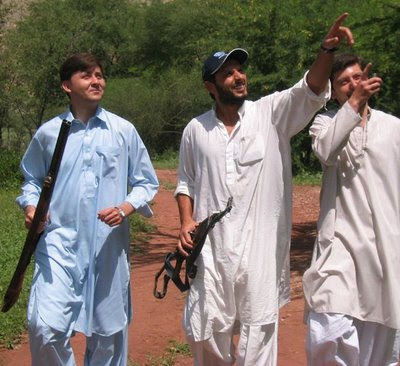 Afridi takes out his gun, calls his men, and goes into the mountains to look for his prey. He spots his target up in the sky and points to it with a smile that shows that he likes what he is going to shoot. His men seem to agree. He then finds an open space, sits down, gets into position with his gun, takes aim, and fires! 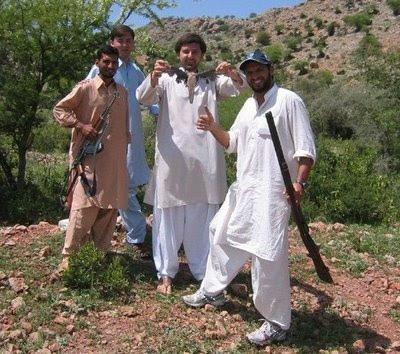 Once the target is shot, he gets one of his men to fetch it and hold it up for the cameras. 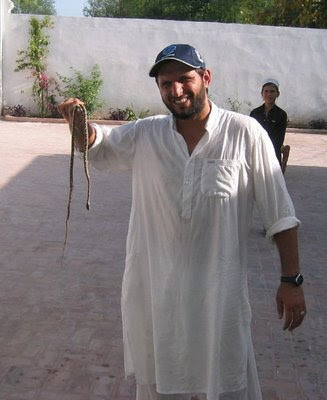 Afridi poses with it, looking as pleased as he does when he gets his targets on the cricket field. I wonder if the Afridi one-arm-raised salute comes out every time he connects with his fire. Once he's done with all his hunting, he resigns to his farm house, where he plays with snakes in his back yard. See it all yourself to believe it. Monday, June 29, 2009 This comment has been removed by the author. don't you have personality like maneka gandhi in pak...? lol, is there PETA in Pakistan? Maneka Gandhi, PETA, yeh sub kaun hai? Nothing like that exists in Pakistan..
Q - you guys are lucky there is no Menaka Gandhi in Pak. As for PETA - Thats People for Ethical Treatment of Animals. They are there worldwide now and make life hell for hunters etc. So much so that nowadays they are after non-vegeterians to convert to being a vegeterian. As far as I am concerned, I cant live without my seafood so I am probably in the hitlist of PETA. Yeah I know PETA but I don't know whether they r there in Pakistan or not.. and if they are then I'm not sure how much they can enforce their law in the rural areas.. 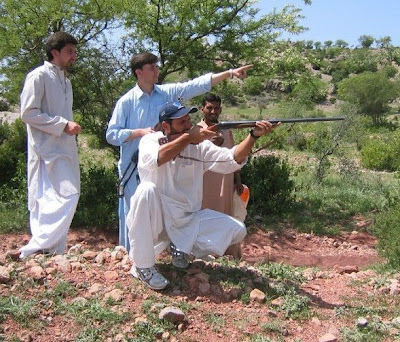 Hunting goes on rampantly in Pakistan.. I haven't yet heard of a PETA case.. If these are pre-t20 WC, bet he shot himself in the foot. Guys, From where u got these pictures. I got them in an email from a friend. Why do u ask? 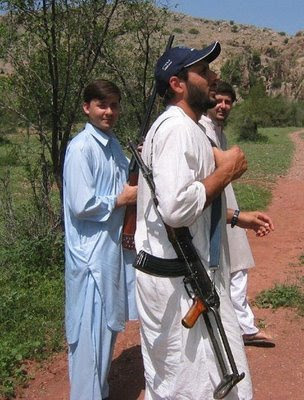 its in pushto but the first minute is interesting and the guy knows how to handle guns! NO, he was not shooting at the zebras and the dears! no wonder he is called boom boom..
Thanx for those video links.. awesome! I got those 2 pics with these as well and some others of him with his family.. He's shooting birds.. and playing with snakes..
Thanx Pertie and welcome to Well Pitched. "Such as Michael Vaughan and his real estate investments, Shane Warne and his nurses, Shoaib Akhtar and his genital warts, Imran Khan and his love child, Andrew Symonds and his "binge drinking", to mention a few." When these bastards would realize who is the are the real Animals ? I thought these people kill animals for that unseen god, but seems they killing even for nothing. bastards! Hay! What a Country is this? Can anyone use full automatic T56 Rifle for hunting in this part of the World? I understand that's the reason there's no law and order in thi Country.And the other thing is what a fool him to use that kind of weapon for hunting whish is made for military purposes.